Year Dated Limited Edition! 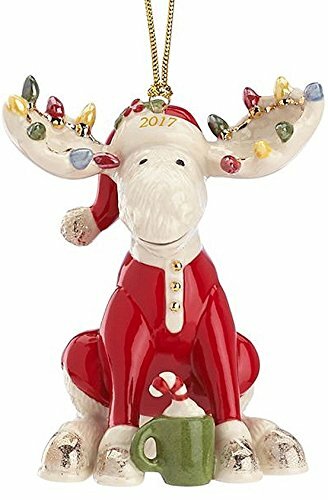 Crafted of hand-painted Ivory China —- Crafted for Christmas 2017 Accented with Gold —- Bears the Lenox Hallmark Includes Gold Tassle Cord For Hanging — Includes Red Lenox Presentation Box Height: 4 1/4″ Bright Christmas lights adorn the antlers of the 2017 Marcel the Bedtime Moose Ornament. This year finds Marcel ready for bed, dressed in bright red pajamas. This annual year-dated ornament is crafted of hand-painted, gold accented porcelain. A wonderful whimsical addition to any holiday tree.